The rhythm of my life in recent years is such that I have little time for paper and ink reading but lots of time for listening. In 2018, I read about sixty books that way. Though nearly all of them edified me in one way or another, most would fall into the category of relatively frivolous fiction. My thinking was that listening, especially while driving, exercising, or doing chores, wouldn’t permit enough concentration to do any thoughtful non-fiction reading—so why bother? I was wrong. Though the good is often the enemy of the best, the reverse is often true: passing up on the merely good in hopes of gaining the best often gains neither. 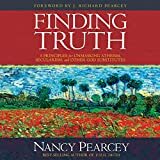 Last summer, a discussion here at SharperIron raised the topic of Nancy Pearcey’s Finding Truth, and we later posted Don Johnson’s Proclaim and Defend review of the book. I felt drawn to the book and decided to give it a whirl in audio. The audiobook amply rewarded the effort—enough to compel me to write my own review. The Audible version of Finding Truth clocks in at 8:44:19 and is read by Pamela Klein. I normally listen at 1.10x or faster and found that Klein’s pace was about right for me at 1.10x. Klein’s reading is not at all robotic, as is sometimes the case with nonfiction audiobooks. Though Klein seems to lose Pearcy’s flow of thought at times, the reading is clear and alive enough to not be a distraction. Pearcy’s subtitle is an indicator of one of the book’s best features: Five Principles for Unmasking Atheism, Secularism, and Other God Substitutes. The author aimed to make this book accessible, and it’s uncomplicated structure helps achieve that. Pearcey lays out the didactic purpose of the book early on, and for the most part it succeeds in laying out the essentials of some of the most important philosophies and belief systems in a way that doesn’t require much background in philosophy. Though readers of Francis Shaeffer will find much that is familiar in Finding Truth, Pearcey’s treatment is easier to pick up and easier to follow. Though the book doesn’t require a minor in philosophy, a couple of semesters of history of western civilization doesn’t hurt, and absorbing a basic philosophy survey (such as R. C. Sproul’s The Consequences of Ideas) helps also. For me, having picked up what little I know of western philosophy in bits and pieces, the book was excellent for pulling together previously scattered concepts and relating them to each other. Christians who have grown weary of the constant, subtle—and occasionally not subtle—anti-intellectualism that characterizes many evangelical and fundamentalist ministries are likely to find the book refreshing. Pearcey is unabashedly reason-affirming and intellect-affirming. The book is a strong reminder that God made us thinking beings and that we are to love Him with heart, soul, mind and strength (Mark 12:30). Early in Finding Truth, the author describes her frustrations as she grew up in a Christian denomination, found herself intellectually dissatisfied, then found that nobody seemed to have answers to her questions. That resonated with me. Though I wasn’t openly asking questions in high school, I was listening critically and analyzing. Like Pearcey, I was hearing a lot that didn’t make sense. Unlike Pearcey, I didn’t conclude that Christianity is for idiots. At home, sometimes at church, and sometimes at the Christian high school I attended, I encountered Christians who expected Christian teaching to fit together into a self-consistent, comprehensive belief system that addressed all of life. Along the way, I was exposed to writers like C. S. Lewis and Francis Schaeffer. Also unlike Pearcey, I had come to truly know Christ as a child. The book explains how Pearcey left Christianity as a youth, seeing it as philosophically shallow and intellectually dishonest—but she did this having never understood and believed the gospel. She eventually found her way to L’abri, debated with Schaeffer and friends, and discovered a Christianity she had never known existed. Pearcey’s journey raises an important question: Who is providing a comprehensive Christian worldview—including a fully integrated intellectual life—for the young thinkers in our churches today? Admittedly, not all teens are critically evaluating the teaching they receive, noticing contradictions, and searching for a belief system that covers everything and truly coheres. Pearcey seems to assume a larger number of young people thinking at that level than actually are. But what about the ones who are? For that matter, what about much older adults who are looking for these kinds of answers? In my current ministry setting, I can’t systematically feed those particular sheep. What I can do is try to make sure they’re aware of where the answers they crave can be found. Finding Truth is a new arrival to the short list. “Idols have consequences.” The basic thesis of the book is that all the non-Christian worldviews (generously so-called, because they fail to accommodate all that is in the world) fail by attempting to make some single feature of reality the One Thing that explains everything else. This One Thing is an idol, because only God should have that function. Because reality is what it is, only God truly can have that function. “Ultimate explainer” – One of Pearcey’s apt terms for whatever intellectual idol the belief system is attempting to employ. God created us to think, and the Christian faith is rational. Autonomous reason vs. yielded reason – The former attempts to think its way to the answers to life’s big questions while excluding God (rationalism). The latter accepts God as the key and reasons from what He has revealed (both specially and generally). Critical thinking is part of faith. A section of the book near the end is dedicate to developing this principle. Nobody is completely wrong. There is always something partly true, partly plausible, partly successfully explained in a godless belief system. This has many implications. One of the more interesting ones is that there are always points of agreement that can be starting points for conversation. Pearcey argues at some length that people who embrace philosophies that reject free will are forced to behave as though free will existed, and that the Christian worldview wins on that point because it insists free will is real. I wasn’t able to determine if Pearcey’s idea of “free will” means merely “not biochemically determined” or if it means that and also “not spiritually or volitionally determined.” The book focuses on rejecting the idea that human will is an illusion and is actually the result of complex chemical and environmental programming. However, since many seem to believe the will can only be “free” if it is not determined by anything at all, and since the free will concept is a major argument in the book, I would like to have seen more on what she means by the term. If we happen to cross paths at Walmart (where everybody stops to talk philosophy) I’ll definitely ask—after I tell her how much I enjoyed Finding Truth. Thanks for the review Aaron and especially for pointing out its availability on Audible. I have a job that allows me to listen for several hours per day so I am always looking for more resources. I have wanted to read it since Don’s review. Based on your review I’ll try it soon. If you read Finding Truth and enjoy it, you might also find The God Who Is There by Francis Schaeffer interesting and helpful. There's an Audible version of the 30th Anniv. Edition of the book. Just finished a few weeks ago. I don't know if I'll get to writing a review of that one, so I'll just say that for me the book was a feast. The reader is quite robotic though, for an actual human. Lovely voice, but rarely much indication that he's mentally engaged with what he's reading. But you get used to it mostly, after a couple of hours, and I found that I greatly enjoyed the book anyway. One thing the reader does well is capture Schaeffer's gentleness. Still, I'd love to see a new production of the book, read by someone who's really into it. At the moment, I'm listening to Alvin Plantinga's Where the Conflict Really Lies: Science, Religion, & Naturalism. Very competently read by Michael Butler Murray. I check out digital audiobooks from the library and listen to them on the way to work (30 mins. each way). But, I play them at 2.0x ... I just finished Meacham's biography of George H.W. Bush, and am listening to Moneyball right now. Before that, I listened to Max Hasting's Retribution, an accoint of the last year of the war against Japan in the Pacific. I listened to about half of Pearcey's Total Truth a few months back, but gave it up. It''s good stuff, but I'd heard all this before. I've been soaked in a Reformed, presuppositional approach to things. Pearcey just didn't have anything new to say for me, in that book. I also listen to kindle books with accessibility on an iPhone. If you can get past the robo-voice the options are almost limitless. My opinion: Pearcey makes the complex easier to understand. Schaeffer, for all his great mind, makes the complex seem even more complex. A lot of times great thinkers are not great communicators. And Schaeffer was truly one of the great Christian thinkers of the 20th century.